The BiBatchConverter Service Manager was introduced in version 4.11 of the BiBatchConverter and is a utility to provide an easy-to-use automated batch printing and document conversion Windows service with user interface. The Service Manager let the user to interact and configure the BiBatchConverter Service which converts the documents in the background. The BiBatchConverter service can run under "Administrator" account instead of under a particular user or System Account. This allows the service to continue the document conversion even after the current user logs off in unattended mode. When starting up the BiBatchConverter Service, the red line indicates that the service is not installed. To install the service, click on the Install Service button on the top-right corner. The following window appears. Enter the Administrator user name, password, configure the service start mode and Startup Delay. The BiBatchConverter service must run under a local administrator account who already once logged in on the computer. The BiBatchConverter service cannot run under system account. Automatic: The service starts automatically when the Windows starts. Manual: The service must be started manually every time after the Windows starts. Specifies the time in seconds to start the conversion process by the service after the service is started. The purpose of the Startup Delay is to make sure that certain required processes used by the service for conversions are started and running, before service starts the conversion. The built in Startup Delay is 100 seconds. When the configuration is finished, click on the Install Service button. The following window appears, if the service was installed successfully. Click on the OK button, and the red color changes to green, indicating that the service is installed, and ready for the document conversion. 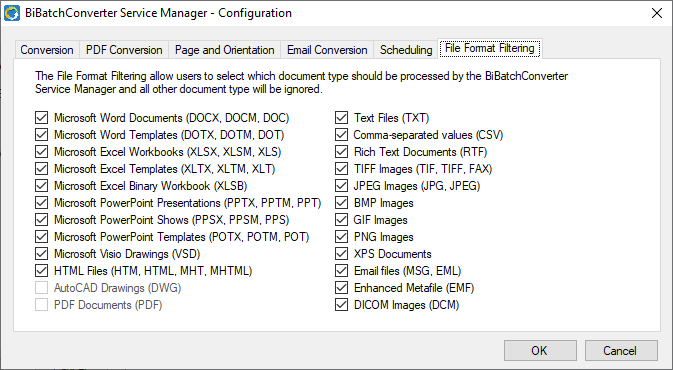 For information on how to start converting documents, refer to the Starting the BiBatchConverter Service Manager section. 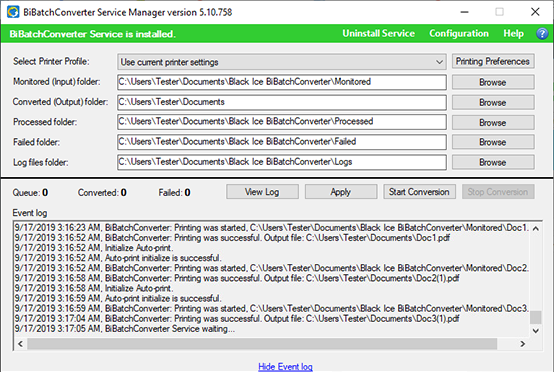 The BiBatchConverter Service Manager installs automatically as part of the BiBatchConverter, and it can be started by the BiBatchConverter Service Manager shortcut on the desktop. 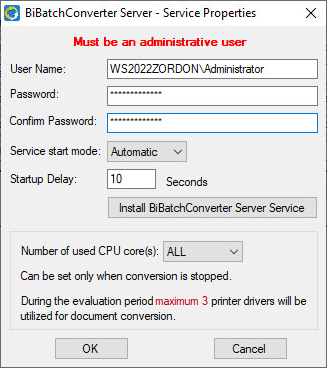 NOTE: The BiBatchConverter Service Manager requires Administrative privileges. To start the Service Manager as Administrator, right click on the shortcut and select the run as Administrator option. 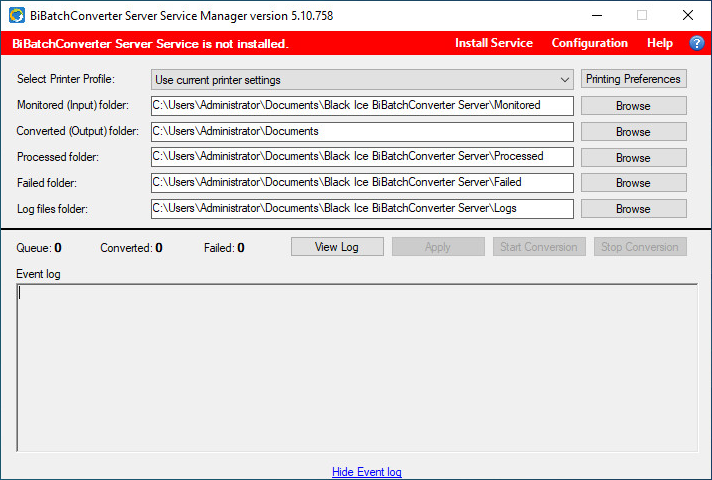 Once the Service Manager is started, the colored line under the title indicates the status of the BiBatchConverter Service. The red color indicates that the service is not yet installed therefore the Administrator must install it through the Service Manager. To install the service, refer to the Installing the BiBatchConverter Service section. Applies a predefined profile for the document conversion. Select the directory directory which contains the documents need to be converted. Specifies the path of the directory which contains the successfully converted documents. If it’s not configured, the converted documents will be saved into the Printer Driver’s output directory. Specifies the path of the directory which contains the original documents, which were successfully processed/converted. The files which cannot be converted will be moved into this directory. Specifies the log file’s location. The sample logs every printed filename with path, printing date/time, elapsing time and every occurring warnings and errors during the printing. NOTE: These settings are also can be configured in the /Service Manager/BiBatchConverter Service.ini file. Please be aware, that the changes made in the INI file applies after restarting the BiBatchConverter Service. Once the service is configured on the user interface, click on the Apply button to apply the changes in the service. Click on the Start Service button, and the BiBatchConverter Service start to monitor the input directory and convert the files. For more information on how to configure and fine tuning the document conversion preferences please refer to the Fine Tuning Document Conversion section. The service will save the printed documents in the same name as the source input document. For example, if printing 1.jpg to PDF file format, then the printed document will be named to 1.pdf. NOTE: If there is already a file named 1.pdf, service will overwrite the existing file. The base requirement is MS Office 365 or 2016 or 2013 or 2010 or 2007 and Adobe Reader 10 or higher or Adobe Acrobat Pro 10 or higher to be installed on the server. 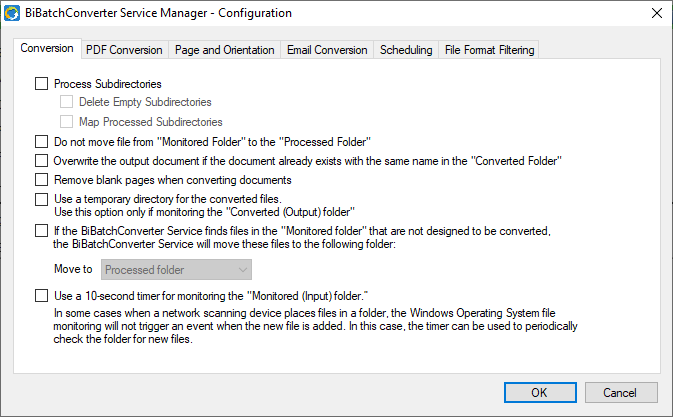 To reach the settings of the BiBatchConverter Service, click on the Configuration button on the Service Manager user interface. The BiBatchConverter Service Configuration window appears. 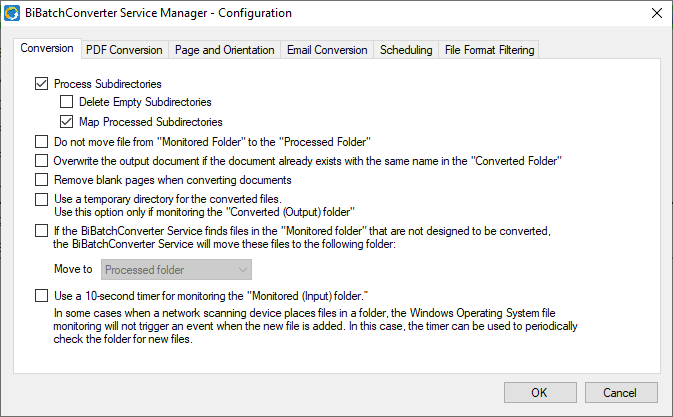 Conversion Settings covers options for configuring the BiBatchConverter Service, how to process the files and directories. Process Subdirectories option converts the documents from the subdirectories of the monitored directories. Delete Empty Subdirectories option deletes the empty subdirectories of the specified input directory. Map Processed Subdirectories option mirrors the subdirectories and folder structure from the original monitored directories. This feature can be very useful if the user has several subdirectories and categorized, structured folders. If the Map processed subdirectories option is disabled, BiBatchConverter converts all the documents without directories into the Output directory. Do not move file into the Processed folder (Delete files after conversion) option deletes the converted documents from the source directory, once the document is converted successfully. 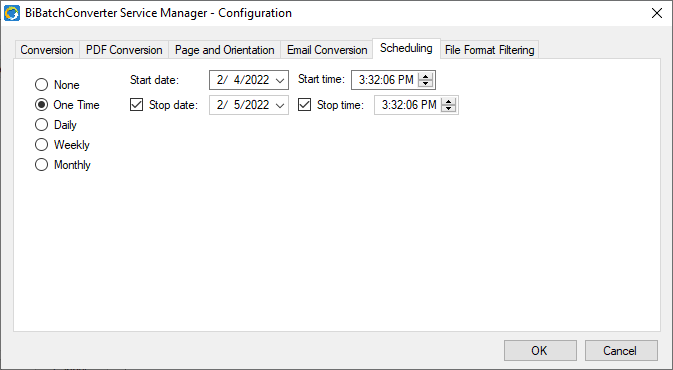 Scheduling Settings covers options for scheduling conversion for BiBatchConverter Service. None option disables the Scheduling. If this option is selected, the service will process the documents immediately from the configured input directory. One Time option initiates and stops the conversion in one specific date and time, and not processing new documents until the scheduling is not changed. NOTE: If no Stop date and time was selected, the conversion will not stop until the user stops it. Daily option initiates and stops the conversion in one specific time on every day. Weekly option initiates and stops the conversion in a specific time on the selected day(s) at every week. Multiple days can be selected. Monthly Days option initiates and stops the conversion in a specific time, on the selected dates of every month. Multiple days can be selected. Monthly Weeks (On) option initiates and stops the conversion in a specific time, on the selected weeks and days of every month. Multiple days can be selected. If one selects First week from the left table, and selects Monday and Wednesday from the right table, the conversion will be scheduled on Monday and Wednesday on the first week of the month. If one selects Last week from the left table, and selects Saturday from the right table, the conversion will be scheduled on Saturday on the last week of the month. Please be aware, that if the last week of the month ends before Saturday, then the conversion will not start that month! NOTE: If stop time was not selected, than the conversion will stop at midnight. NOTE: If the stop time is earlier than the start time, the conversion will stop on the next day, at the specified stop time. For example if set up 4:00 PM as Start time, and 3:30 AM as Stop time, the conversion starts at 4:00 PM and stops the conversion at tomorrow 3:30 AM. Under File Format filtering users and administrators can configure which documents must be processed by BiBatchConverter Service. For example: If only the Microsoft Word Documents option is selected, then the BiBatchConverter Service will process only the Microsoft Word documents. The Print Email Settings covers settings for printing Email files with .MSG and .EML extension. Email and attachment – option prints the email (email body with From, Sent, To and Subject field) and the attachments too, as separate documents. Email only – option prints only the email (email body with From, Sent, To and Subject field) and ignores the attachments. Email body and attachment – option prints the email body and the attachments too, as separate documents. Email body only – option prints only the email body and ignores the attachments. Email attachment only – option prints the attachments only, and ignores the email. Merge email body with attachments option merges the email body and every attachments of an email file into one single output document. 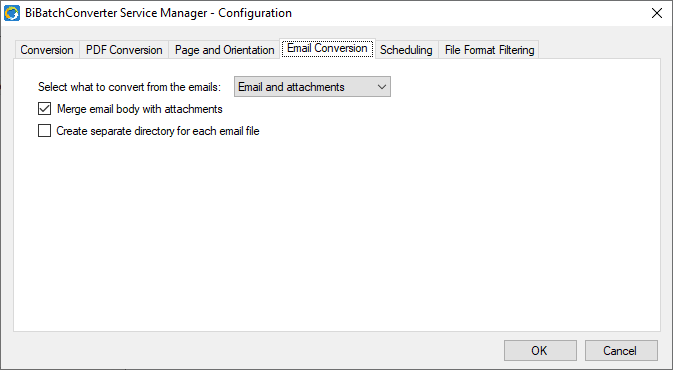 Create separate directory for each email file option creates directory for each email file, where the folder name will be the name of the email file, and the converted email body and attachments will be placed into this folder.